There is a lot of talk about whether or not M-Pesa’s success in mobile money can be replicated in other African countries (the best answer thus far comes from this GSMA research, which basically says yes in East African, and not yet outside of the region.) There is a similar conversation happening in the context of innovation hubs, where Kenya has yet again set the gold standard with the iHub. The iHub “is part open community workspace (co-working), part vector for investors and VCs and part incubator.” It is has spun off several new companies, registered thousands of members, and become the meeting place in East Africa for the international tech community. This wild success has inspired similar innovation hubs to sprout up across the continent, and many are struggling to live up to the high expectations set in Nairobi. volunteer leadership of Lukonga Lindunda. During my visits, it was clear that the key difference between the Bongo Hive and the iHub is fairly simple: in Kenya, there already was a tech community before the iHub, and this community was craving a gathering space. In Zambia, there is no existing tech community, and therefore the Bongo Hive has to build the community at the same time as creating a space – which results in an entirely different purpose and set of challenges than those that faced the creators of the iHub. Kenya benefits from a relatively well-educated urban population and an entrepreneurial environment driven in no small part by M-Pesa. In Zambia, on the other hand, many of the those who come to the tech hub are young, fresh out of university, and with few job prospects because of the high unemployment in the country. Therefore, the greatest success of the Bongo Hive, thus far, has been providing a space for these young graduates to join an informal learning environment where they can practice programming skills, and subsequently gain employable skills. 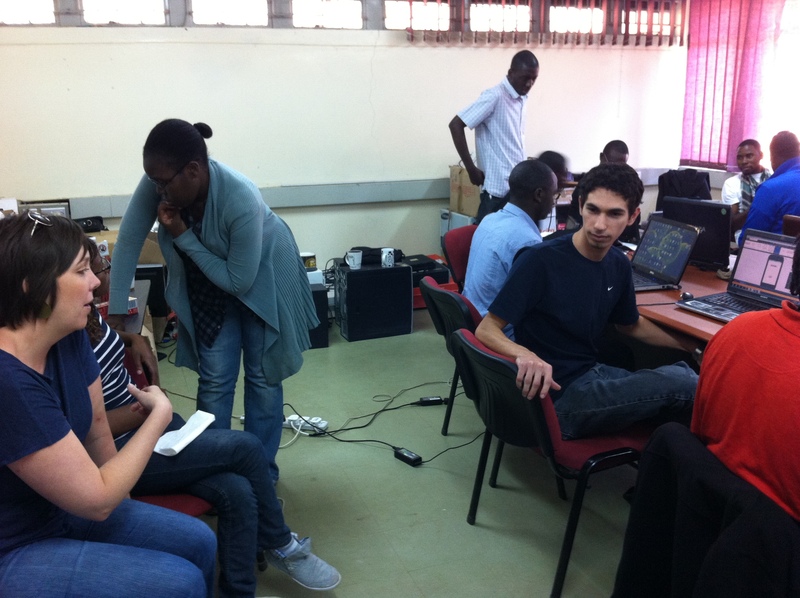 In fact, the Bongo Hive has thus far spent next to nothing, living off of in-kind donations of a few computers and a temporary space, and yet has had real impact on the lives of several young people who are now gainfully employed, thanks to the experience gained by simply showing up and programming. These results, in my opinion, show an extremely strong return on investment. I can only imagine the impact that this space could have with a bit of funding for more computers and a permanent space. 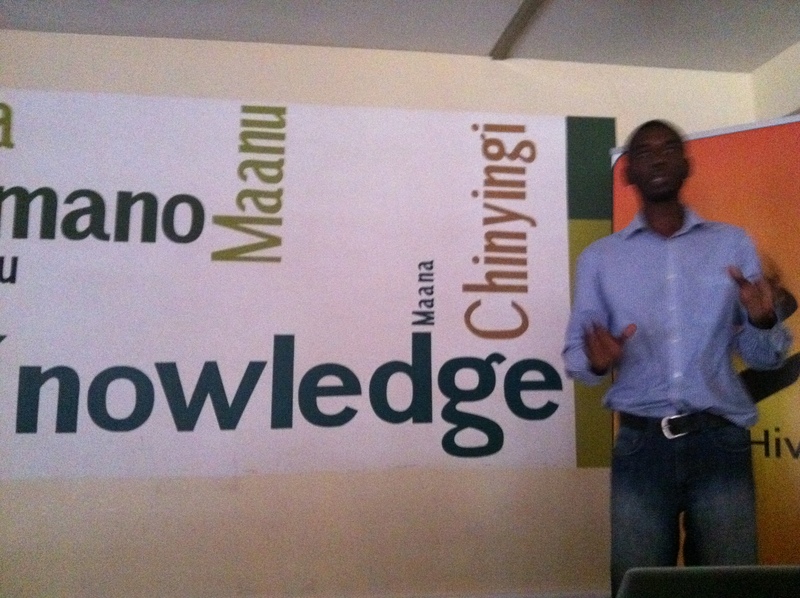 The innovation hubs I’ve seen outside of Kenya, including the BongoHive, the iLab in Liberia (one I have yet to visit, but which I have followed closely through my dear friend Kate Cummings), and the Ayiti Living Lab in Haiti, realize that they there are operating in a different context than Nairobi and therefore have a different mandate. Theirs is one of social change, of building a community that is not yet tangible, and equally, of building the confidence of young people who are so often deprived of learning critical skills during their formal education. The Bongo Hive benefits greatly from the support of the iHub founders, and many big names in the African tech community have already made their way to Lusaka, to inspire and work with young Zambians who wouldn’t have had an opportunity to meet role models from companies such as Google and Ushahidi otherwise. So while it may not be replication, it is impact, one step at a time. I was recently in Kabul to work with one of MEDA’s microfinance partners in Afghanistan, Mutahid. In January 2012, Mutahid made a strategic decision to allow their clients to repay loans through M-Paisa, the mobile payments service offered by the largest telecom in the country, Roshan. Although other banks in the country, including MEDA’s partner FNFB, allow their clients use M-Paisa for repayments, Mutahid is the only financial institution that has decided that this is the only acceptable method of payment. The motivation is to have cashless branches, in order to avoid fraud and to give their loan officers more time to focus on credit management, rather than cash management. In addition, Roshan received financial support specifically for this partnership by USAID’s program to Financial Access for Investing in Afghanistan (FAIDA). Thus far, approximately 700 clients have repaid their loans at least once via M-Paisa. 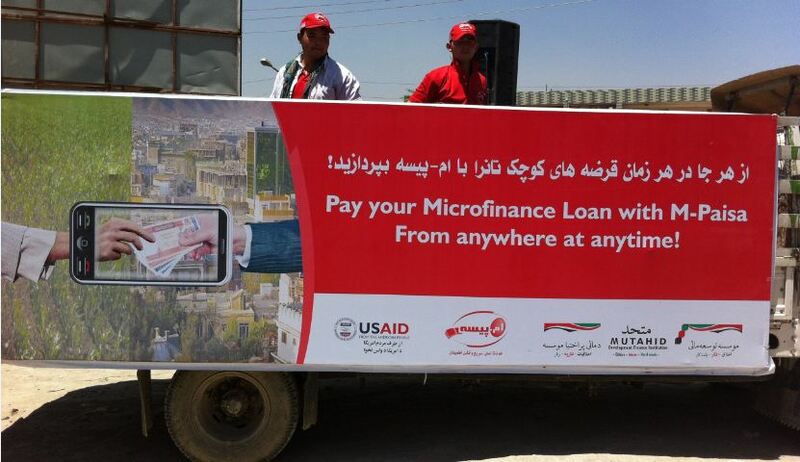 While Mutahid is unique in the microfinance sector in Afghanistan for trying to use mobile money to move away from cash entirely, it is one of several partnerships that Roshan is pursuing to create demand for M-Paisa in the country. M-Paisa is suffering from the same challenges as many other mobile money deployments worldwide, including t lack of customer education and lack of a reliable agent network. In addition, there are challenges more unique to the Afghan context, including extremely high levels of illiteracy, on-going instability in the country, and the legacy of the recent Kabul Bank crisis which has left most people with little to no trust in banks. In Kenya, M-Pesa benefited from the fact that people trust the operator Safaricom more than banks; in Afghanistan, people seem to be even more skeptical of trusting a cell phone company with their money when the banks already failed to safeguard their deposits. The launch of at least 3 new mobile money services by the end of 2012, from each of the other MNOs in Afghanistan – Afghan Wireless, Etisalat, and MTN. The development of an electronic payments switch, funded by the World Bank and run by the Afghan Payment System (APS), will allow for interoperability of cards and mobile payments. Personally, I expect the latter development to be more significant in the long term, as it will modernize the entire financial sector and provide the basis for offering a variety of electronic payment services to Afghans, including debit cards, credit cards, and mobile financial services. The launch of the 3 new mobile money services will help to bring competition to the mobile money sector, which should help to improve product offerings, agent professionalism, and customer service. Unfortunately, all 3 new services look like they are also going to be modifications of the Kenya M-Pesa model, rather than innovative services grounded in the Afghan context. It is also unclear whether these services would be launching without support from USAID, which questions their sustainability if the companies do not quickly gain a high volume of customers, or as the US government starts to withdraw support from the country. Is Mobile Money Relevant to Refugees? 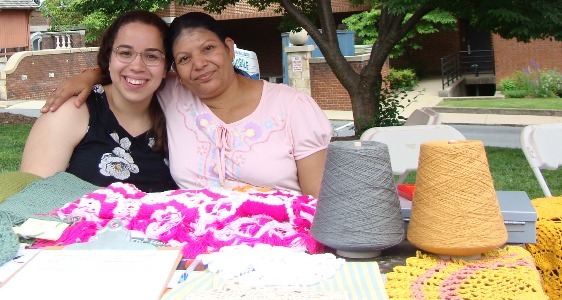 My first professional experience in the international development field was at the International Rescue Committee in Charlottesville, part-time while at the University of Virginia. Working in a resettlement organization provided me with a unique chance to interact closely with refugees from countries including Iraq, Uzbekistan, Burma, and the DRC, and to hear their incredible stories of fleeing terrible situations and eventually finding themselves in Charlottesville, a safe, comfortable place where they could send their kids to schools for free. Of the many things I learned from this experience, there was one thing that struck me the most. Despite the fact that many of these people had been professionals in their own countries before being forced to flee, they started out their new life in debt. Unable to take any assets with them, they had no money or belongings – only a plane ticket to America which the US government asks them to repay, eventually. Now, I know that resettlement is an incredibly complex issue and that there is a seemingly endless stream of challenges in dealing with refugee populations. At the same time, this idea of loss of assets struck me as one challenge that we should be able counter, fairly simply, in our modern world where electronic money is becoming the norm. I was so interested in this concept that I considered writing my Masters thesis on it; unfortunately, there simply wasn’t enough literature or activity in this area to do so, at the time – and this was just a few years ago. Now, with mobile and electronic banking spreading throughout the developing world, and with organizations testing the use of new financial tools for a variety of development and humanitarian, purposes, I am excited about the possibility to revisit this topic. There is a fair amount of work and interest being focused on how to use e-transfers – whether through mobile phones, ATM cards, or vouchers – to send people money quickly when a disaster hits (see this recent article which provides an overview on some of the projects being carried out by Concern Worldwide.) This is a great start. However, from a resilience perspective, we have a lot more work to do to make sure that people can build assets over time and access these assets from anywhere. In order to do this, there are are three steps that I see as critical, which cover the financial education, regulatory environment, and quality of service. Second, regulations need to be in place that ensure that people can access their accounts even if they lose their official form of identification – this was a major issue after the earthquake in Haiti, and is true of many of the types of situations that create refugees in the first place. Regulations and services also need to be in place in order to allow these accounts to be accessed in any country – in the current situation, I can access my Citibank account worldwide, but a Kenyan can only access their M-Pesa account in Kenya, which would leave them without access to those funds in a refugee situation where they were not able to return to Kenya, for any reason. Thrid, people have to trust the organizations that provide these accounts, so they feel comfortable converting non-liquid assets, such as livestock, to electronic stored value. While all individuals and households should make their own decision about how to diversify between liquid and non-liquid assets, it is important that they understand that only assets held in electronic form will be accessible to them in the event of a crisis where infrastructure is destroyed or where they cannot return home. These are a few of the factors that I think are critical – I would love your thoughts on what else would be required to make mobile money relevant to refugees. From July 2010 to July 2011, I worked at a cell phone company in Haiti, Digicel, where I designed, tested, and implemented the first mobile money product in Haiti, TchoTcho Mobile. 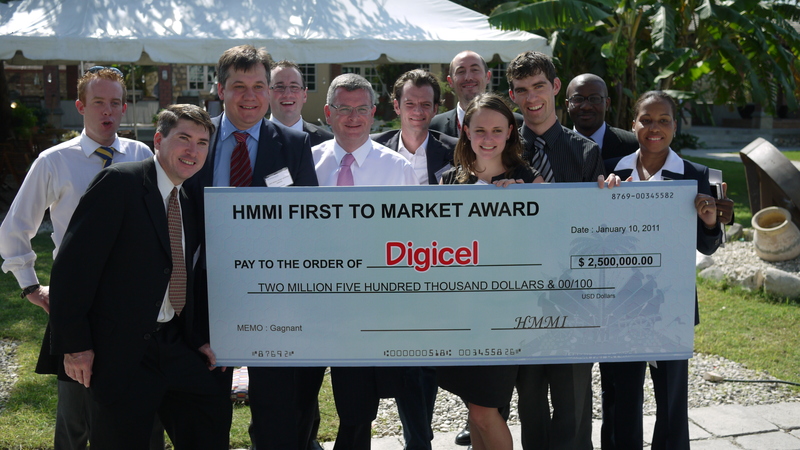 Digicel had explored the idea of launching mobile money before the earthquake occured in January 2010; however, the impetus to launch when they did was in large part due to the Haiti Mobile Money Initiative, a $10 million incentive fund launched in partnership between USAID and Gates Foundation. The scaling phase of this award is still in process, and it was recently announced that the two existing mobile money products, TchoTcho Mobile and T-Cash, have reached 1 million transactions combined (press release here.) Despite this impressive achievement, for those carefully watching the progression of mobile money in Haiti, it has clearly not reached a tipping point where a significant percentage of Haitians are using the product. As Dalberg put it in their recent report, ‘there is more to be done in establishing these services,’ and operators are still grappling with the challenge of ‘build[ing] a critical mass of active users around a well-designed and well-supported service delivery model.’ The same report outlines many of the challenges that the operators have faced in terms of consumer education, regulatory, and partnership issues. Digicel’s specific operational challenges were very openly and honestly discussed by the former CEO Maarten Boute at the GSMA Mobile Money for the Unbanked Working Group in Barcelona in February of this year, and the video of that interview can be found here. So what can be done? With the incentive prize coming to an end, there is a question of how the development sector can continue to engage with mobile money in Haiti and to support the adoption of the product throughout the country. I am often asked this question: What can we do? because of my experience, and one of my first answers is: Everything in Haiti takes longer than expected, and a little patience goes a long way. However, with deeper thought, I have come up with a few ideas that I believe can be practically implemented, and which aren’t the commonly cited solutions – which include more customer education and lower the legal transaction limit of 10,000HTG (250 USD), both of which are critical parts of the equation. Build products that address the need for security – I truly believe that mobile money in Haiti will be a success because I saw in my time at Digicel that there is real demand for the product. This demand first and foremost came from the need for secure ways to store and send money, which do not yet exist in a country which has a high amount of theft. I saw that many of our customers were using TchoTcho Mobile to save small amounts of money on a weekly basis. In another situation, we interviewed market retailers who were using the service to immediately deposit cash after making a large sale, so that they were not targeted by thieves due to the visibility of the sale. This real demand is there and can be accessed with proper communication of the value proposition, and with well-trained and accessible agents. Encourage the platform providers to open up their systems – Allowing 3rd parties to build apps on top of the existing platforms is the quickest way to expand products and services – think Twitter, Facebook, and the iPhone – 3 of the most successful products in recent years, all of which have driven usage through 3rd parties (think Farmville!) Currently, it is extremely hard to integrate the TchoTcho Mobile back end (provided by Yellow Pepper) with any other system, even a bill payment system for say, a water company. This change would take time and a bit of resources, but could make a substantial difference. Conduct research on how to make retail payments (or bill payments, etc.) work – I recently met with FinMark Trust who are doing a similar study in Zambia in order to try to jump start the mobile retail payments industry there. Research is a good use of donor money in this situation because the operators are short-staffed (per Maarten’s comments in the above video) and therefore having an outside party provide research on how to enter new markets with value-added services (VAS) can help to kick-start new projects. Recognize the potential for a non-MNO actor to enter the market – This is absolute blasphemy coming from someone who spent a year working at the MNO and fully believing in the strength of the MNO to drive mobile money. 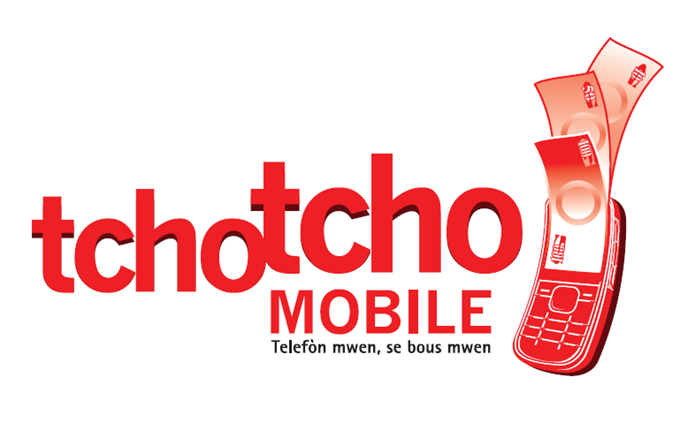 I still believe that Digicel can drive TchoTcho Mobile and that the product will be successful. At the same time, I am now working with innovative start-up companies such as Mobile Transactions in Zambia, and I see that they can create different, creative products for new market segments (more on this on the CGAP Technology blog.) MNOs are great at delivering mass-market products, such as airtime or peer-to-peer transfers, which are accessible and useful to almost everyone. There is less evidence that they are able to successfully develop and provide services to smaller population segments, such as smallholder farmers or savings groups. Development actors can help MNOs do so, as is the case with Grameen app lab in Uganda, while at the same time companies such as Mobile Transactions are proving that a 3rd party can find a viable business model in serving these different markets. So despite the challenges, mobile money is and will continue to move forward in Haiti. There are already many exciting new initiaves which are using mobile money to rebuild houses (with UNDP), to provide funds to purchase food (Food for Peace), and to help parents in Cite Soleil send their kids to school ( Ti Manman Cheri ). These current initiatives show the potential of the service to grow through partnerships, which can help to address each of my points above by encouraging innovation from a wide variety of actors. I personally will continue to support growth of mobile money in Haiti through on-going support for Fonkoze through my current position at MEDA, and as an active observer, consultant, and a passionate believer that Haiti can and must be supported with sustainable, lasting solutions. 5. We’ve talked about the village phone ladies in this course, many are also familiar with one laptop per child. How do NGO work in the space of mobiles and innovation while taking on the risk of unplanned obselesnce is raised and working against evaluation frameworks, donor cycles, etc.? This will be the new paradigm of aid, which will be more “opensource” and harder to measure. Impact will be less about meeting pre-set goals and more about stimulating innovating thinking and social change in less quantifiable ways. In my last post, I wrote about creating community ownership of projects, and focused on the need to ground truth innovation in the design phase. Now, moving onto my second observation from Cite Soleil, I will discuss sweat equity in the implementation process. What is sweat equity? I chose this term to depict the fact that ownership does not necessary mean that communities have to pay for it. It does, almost always, mean that the project will take more time than planned. One example provided to me by my friend Sabina: An NGO decided to build a school in the community. They purchased the materials, but made it clear that the school must be built by the community themselves, and by members of multiple blocs to overcome trust issues (see previous post.) The building of the school started, and stopped, started again, and stopped again. Each time, the NGO did not step in to continue the building, and their consistency made it clear that the community alone was responsible for the completion of the school. When it was finished, the community did not only use the school, but it became a full community center, voluntarily used for community events and social gatherings. On the contrary, a child nutrition center right next door cannot seem to get anyone to come to the center. Why? They built the center without any community buy-in, and failed to recognize that it would have been much more sustainable to provide income-generating activities within the area (which offers very little formal employment) so that parents could afford to feed their children on their own. Another example is this Eiffel Tower. The picture was started by a young and humble graffiti artist, Snake, who will paint upon request for little to no commission, as long as the procurer provides the spray paint. 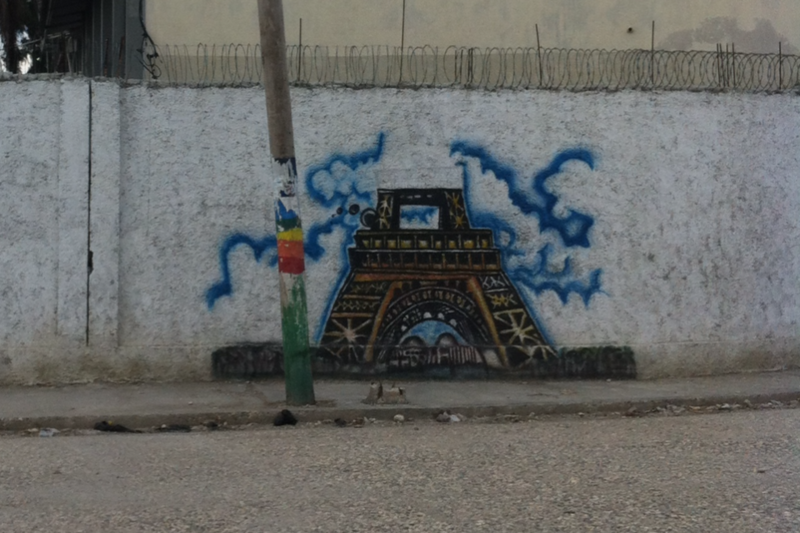 However, spray paint is relatively expensive, and this Eiffel Tower, unfortunately, is not yet finished because the community members who asked for it have run out of money for paint, for the time being. And yet, they still find pride in the picture, which is for the community and by the community, and they are confident that it will be finished someday. Sabina, who still has some American sensibilities despite being integrated with into the Haitain community, has been tempted to simply buy the paint and get it finished. Hwoever, she knows very well that if she did, the picture would be ruined, and would no longer have any meaning for the community. So she’ll just have to wait, too. Community development takes time. I think we all know this, to some degree, and yet the message often gets lost in the world of development aid with our funding cycles, program goals, and an understandable desire to scale quickly. I recently had a chance to reflect on the necessity, and difficulty, of creating community ownership of development projects during a trip to Haiti. I had the privilege to spend time with a good friend, an American woman living in Cite Soleil. Cite Soleil is an area made famous by the documentary film the Ghosts of Cite Soleil, which depicted a violent gang warzone. The area, made of up possibly 400,000 residents and including both rural and urban areas, is still considered one monolithic neighborhood and a “red zone” by many organizations, (meaning that they consider it not safe for international staff.) And yet, development organizations continue to work in the area, many realizing that these negative depictions do not reflect the reality of a community that may have systemic problems but that also has families, children, entrepreneurs, schools, and incredible amount of potential. I’m reminded of a blog post I wrote a while ago on the message of the movie Where the Wild Things Are, which is a story about the “risks of making promises you can’t keep and of trying to solve the problems of people you don’t understand.” Outside projects, no matter how well-planned or funded, will easily fail when faced with the reality of community dynamics, since “relationships and human emotions are complex and messy,” in any society. So how can well-intentioned outsiders help in such an environment of mistrust? Although I won’t claim to have all of the answers, I will share two lessons that I observed clearly during my recent visits. The first, ground truthing innovation in the design phase, is discussed here, and the second, sweat equity in the implementation process, will be discussed in the following post. Ground truthing innovation in the design phase: Brilliant people in the developed world can conceptualize and develop a seemingly infinite number of interesting products to help poor areas such as Cite Soleil, and our tendency is often to build, make sure it works, and then scale. However, testing products within the community (much like the concept of rapid prototyping in product design) can avoid costly deployments of technologies that simply won’t be accepted by the community. A good example of this idea being implemented is the work of Haiti Communitere, an organization that provides a space for international organizations to test new ideas with the community before they are deployed. One idea, to improve shipping containers that have been used as UN offices since the earthquake, was rejected by the community members who tested it and simply stated, This is not a house. 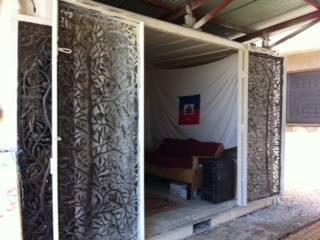 On the other hand, a house being built out of recycled materials from around the area is being embraced by those Haitians who are participating in the building of the house. 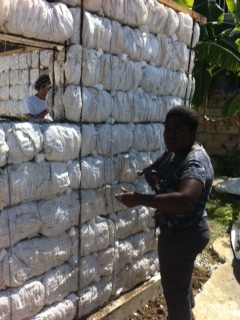 This house is built out of the 1000s of styrofoam containers left in canals and roads all over Port-au-Prince, and yet through clever design and involvement of the community, it is becoming a real home. Therefore, it is not only well-designed to be sustainable and earthquake-resistant, but it will also be an comfortable place for a family to choose to live in with dignity. This process of ground truthing innovation serves multiple purposes: it involves the community in the design process which helps to create community buy-in & ownership; it helps to avoid costly deployments of technologies that will be rejected by the community that we are intending to help; and it stimulates further innovation by providing (in the case of Haiti Communtere) open-source ideas that can be modified and adapted to work in other communities. This creates a low-cost scaling mechanism which can create a larger amount of impact, over time, by creating a ripple effect of innovation in communities across Haiti. Of course, this may also prove to be difficult for organizations to accept since it will be harder to take credit for and to evaluate the impact of open-source development projects, especially if the real impact will come from other people implementing your idea without you even knowing about it. Yet, if our goal is to create sustainable change with limited resources, then we may have to challenge some of ideas of how to evaluate impact. I would love examples or thoughts on how your organization is handling these challenges.